After enjoying the ‘In the Bag’ challenge so much I thought it would be good to join in another blog event. I spotted the ‘No croutons required’ event over at Tinned Tomatoes run by Holler. It’s a vegetarian challenge, I’m no vegetarian but I do like a bit of a challenge. One of the things I’m finding so great about food blogging is checking out the other food blogs and from that getting the grey cells moving to come up with new ideas or remember forgotten favourites. Suddenly lots of ideas come together and you want to try something different. This months ‘No croutons required’ has an extra twist – its been Holler’s birthday and so along with the soup or salad (based on tomatoes this month) we also have to come up with a birthday dinner menu for Holler – fortunately we don’t have to cook and test the whole lot together – though I’m thinking it might be wise to at least have tried the rest of the menu before? Hope Holler likes it ? This is (very) loosely based on the Tuscan soup Pappa al Pomodoro. First some tips and WARNINGS! We are actually going to be smoking the tomatoes with a smoking mix of rice/tea/sugar so if you don’t like smokey foods forget it now. If you’d like to go an adventure with me hop on and keep reading. Once the smoking thing gets going it really does make the house smell, well pretty smokey, so ideally do this in the garden, on a camping stove, on the gas ring of your fancy barbeque any heat source you can find. If not open all the windows, shut internal doors, put the extractor on max and hope for the best. The smoke, as well as creating tasty smoked tomatoes, will get all over the pan/steamer you use so don’t use your best/favourite pan as its takes a lot of effort to clean up. Use a non-stick wok if you can and one of those cheap(ish) bamboo steamers. If you have a smoker use it (not them). If you don’t like smokey or chargrilled foods you won’t like this – stop now make something else. Be careful where you put the steamer down post smoking; don’t make an impossible to remove mark on your new work surface like I once did ? Mix the first three ingredients together – makes about 1 cup of smoking mix. Get a piece of foil about 3cm bigger all round than the base of the pan you are going to use. Fold the edges up, tip in the smoking mix, pop it in the bottom of the pan. If you want to skin the tomatoes then nick the skin in a cross on the bottom, plunge in just boiled water for about a minute, remove and peel off skins. I can never be bothered to do this but it’s your call. Put the pan with the smoking mix on the heat, cover the pan and let is start to generate smoke – about 5-10 mins to get a good flow. Put the tomatoes on a piece of foil bigger than the steamer and fold up the edges but don’t cover the tomatoes. Put the tomatoes in the steamer. When you’ve got a good amount of smoke then pop the steamer on top of the pan containing the smoke mix and smoke for up to 15 minutes depending on the intensity of smokiness you fancy – we did about 10 mins. The tomatoes will have cooked and let out juices don’t loose these they go in the soup. And the taste – well it was pretty smokey. I liked it but Ian wasn’t convinced (which is odd because he’s usually a fan of smoked foods). I think if I did it again I’d smoke the tomatoes for less time, maybe use a very subtle tea – although Darjeeling isn’t usually though of as a strong tea the flavour after 10 minutes of smoking its pretty intense, and perhaps use fewer of the smoked tomatoes saving the others to make a bruschetta or toss in a salad. As for the rest of the menu…. Chick pea pancakes with wilted greens and fresh soft cheese: I’d use the recipe in my Spicy chickpea pancakes post but omit the chilli, ginger and cumin seeds and add lots of fresh chopped flat leaf parsley instead. I’d wilt a mix of the nicest looking greens I could find probably spinach, kale and wild garlic for preference, pile these on the pancakes and add some lovely fresh soft cheese cut into slices (ideally I’d get some Stichill or Crowdie but any nice goats cheese would also work well) and then fold the pancakes in half and serve with some steamed leaks and purple sprouting broccoli. For desert there’d be my Rhubarb and pink ginger ice cream, with a dash of stewed rhubarb and a little cream poured over so it freezes on the ice cream in the way I loved so much as a kid. Thanks to all who voted, and for all the comments. Interesting! I won the No Croutons event once with a smoky soup so you could be onto a winner there! I just used smoked paprika though…I’ve not used Darjeeling for smoking but I’ve used Earl Grey to smoke duck which was really, really delicious. Oh wow – wish I could have that menu on my birthday! Helen: thanks, it was pretty smokey soup I’d say. I’ve done the duck thing as well. Its also v good and thats what made me think of this. The smoky tomatoes look great (I imagine they taste good too); just the thing to try cooking outside in this glorious weather! I love your smoking technique! Your whole menu is gorgeous as well… Such a beautiful, impressive entry! Springtime: The tomatoes were really good but not, I think, to all tastes. But good for an outdoor adventure. Astra Libris: Thanks. The technique is good for lots of things, I think I might try it with salmon next – give it a go. Beware thought it really is pretty messy on your pans! Congrats ! Congrats ! the moment I had read this I was sold & you have done such an unique job with the smoke flavor! I am soooo impressed. I love roasted tomatoes & rosemary, & what u did here had everything & more. U deserved it! What a good idea. I’m going to give this a go. I love smoking things. But I have never done anything vegetarian. Hi Browners – glad to have inspired you – hope you have fun smoking veggie stuff. I’m thinking I need a real smoker to try other things in. another garden project! 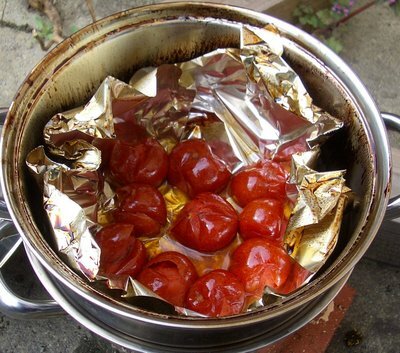 I never thought about smoking tomatoes, what a fab idea!! Tomatoes are one of my favourite things to eat, I must remember this later in the year when we (hopefully) get our crop!